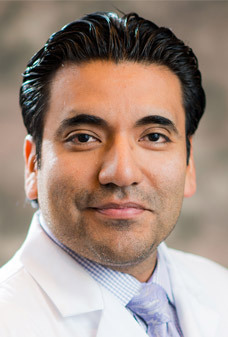 Dr. Ramirez is a board certified Maxillofacial/Head & Neck Surgeon with specialized training in complex tumor resection, minimally invasive robotic surgery and microvascular reconstructive surgery. Dr. Ramirez earned his medical degree from Wayne State University and doctorate of dental surgery degree ... Read More from the University of Detroit Mercy. He completed residency training in Oral/Maxillofacial Surgery at Providence, Wm. Beaumont and Sinai-Grace hospitals. Dr. Ramirez then went on to specialized fellowship training in Head and Neck Oncology and Microvascular Reconstruction at the University of Florida College of Medicine. Dr. Ramirez currently serves as the section Chief of Maxillofacial Surgery at Ascension-St. John Hospital, he is the Fellowship Director for the Head and Neck Oncology and Microvascular Reconstructive Surgery Fellowship at Ascension-St. John Hospital and also serves as the Program Director for the Oral/Maxillofacial surgery residency training program. He is a fellow or the American College of Surgeons, a member of the American College of Oral and Maxillofacial Surgeons, the American Association of Oral and Maxillofacial Surgeons, the American Medical Association and the American Dental Association. Dr. Ramirez lectures nationally and internationally on cancer and reconstructive surgery. He has published in peer-reviewed journals and has authored book chapters in oncology and reconstruction. Dr. Ramirez has also been recognized by his peers locally earning one of Michigan's Top Doc Honors by Hour Detroit Magazine.